City Opera Vancouver’s Board of Directors is delighted to announce the company has been awarded a commissioning grant of $250,000 US from the Annenberg Foundation, in connection with the philanthropic multimedia organization Explore. This extraordinary sum is believed to be the largest single commissioning grant in Canadian history. The Annenberg Foundation, a private US-based family foundation, provides funding and support to non-profit organizations around the world. Explore, a signature project of the Annenberg Foundation, developed the concept of the project and presented the commissioning grant to City Opera. It is awarded for the creation of a new chamber opera, to be developed over a two-year period. It is based on the real life experiences of US Marine Corps Sergeant Christian Ellis at the Battle of Fallujah in 2004. Explore documents the stories of leaders who have devoted their lives to extraordinary causes. Upon their first encounter with Christian Ellis, Explore’s Director and filmmaker Charles Annenberg Weingarten and Executive Producer Tom Pollak were immediately inspired by Christian’s remarkable story. 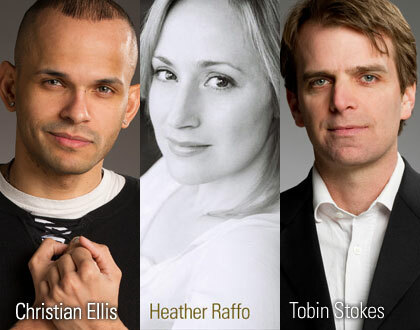 The libretto will be written by noted American-Iraqi playwright Heather Raffo, in consultation with Christian Ellis, and its score by acclaimed Canadian composer Tobin Stokes. Raffo is based in New York City, and Stokes in Vancouver. City Opera will mount a series of four workshops in Vancouver, starting in May 2011. Through these sessions, a process of testing and development, the new opera will be taken to a viable and performance-ready level. This new work is slated for completion in June 2012. Production funding for the opera will be separate from the commissioning grant announced today. If you are a professional singer and interested in auditioning for these workshops, please check the AUDITIONS page on the City Opera Vancouver website. City Opera Vancouver is a professional chamber opera company. Our goal is to bring chamber opera to a wide audience. The company’s repertoire spans four centuries, from chamber opera’s beginnings to contemporary and commissioned works, with a special interest in Canadian music and artists. Opera is music drama: City Opera presents outstanding singers whose talent for tragedy and comedy will bring opera’s human stories to life. The company gives singers new repertoire to explore, and creates new opportunities to hear voices that are at their best in an intimate setting. Accessible and innovative, City Opera offers a unique musical experience to Metro Vancouver audiences. City Opera Vancouver was organized in 2006 in tandem with efforts to restore the century old, 650-seat Pantages Theatre in the Downtown Eastside. The Annenberg Foundation is a private family foundation that provides funding and support to nonprofit organizations in the United States and globally. Since 1989, it has generously funded programs in education and youth development; arts, culture and humanities; civic and community life; health and human services; and animal services and the environment. In addition, the Foundation and its Board of Directors are directly involved in the community with several projects that expand and complement its grant support to nonprofits. Among them are innovative nonprofit capacity building initiatives, the Annenberg Space for Photography, Explore, and the Metabolic Studio. The Annenberg Foundation exists to advance the public well being through improved communication. As the principal means of achieving this goal, the Foundation encourages the development of more effective ways to share ideas and knowledge. Led by founder Charles Annenberg Weingarten, the Explore Team embarks on fact-finding missions to meet the courageous leaders of the non-profit world and document their work through images and films. By sharing their knowledge, Explore seeks to connect people to extraordinary cultures and ideas. These expeditions also serve as a way to identify potential recipients for Annenberg Foundation grants. This blog, managed by Sonia Stastny, will track the ongoing creative process behind our Annenberg/Explore commission. Using interviews and comments from librettist Heather Raffo and composer Tobin Stokes, we’ll keep you up to date on the work and how we do it. We will post updates from director John Wright, from our outside advisors, and from the actors, singers and musicians who will be participating in the workshop process over the next 18 months. We will also add audio and visual materials. Please tell us if there’s anything else you’d like to see, or to know about.